The University of Oregon parking and transportation department is changing its name to Transportation Services. While the unit will still oversee parking permits, enforcement and other issues related to stationary vehicles on campus, the new moniker better fits with the department's role in carrying out the long-range campus plan, which is to move people to and around campus in safe, innovative and sustainable ways. “Parking is, and will always remain, a vital component of this department’s work program, but emphasizing transportation in our department name more readily communicates our broader role,” said David Reesor, who became the department's director in July 2018. "Part of that broader role is mapping out the future of alternative transportation methods that reduce congestion and carbon emissions while making campus commutes easier and safer." 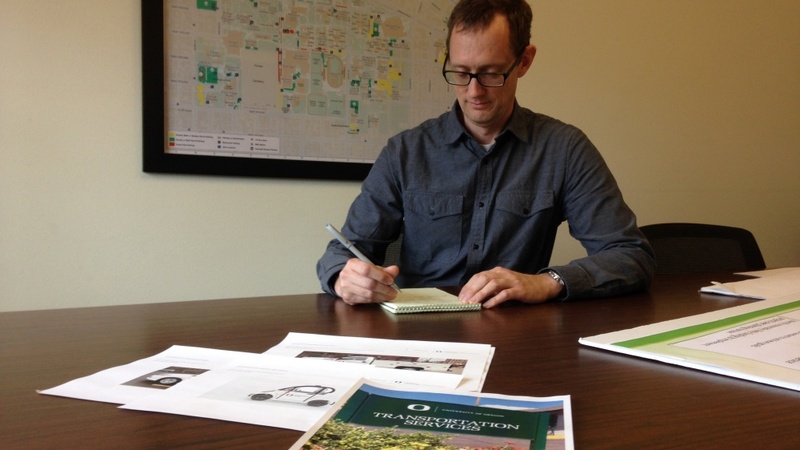 Reesor and his staff are not only working to identify creative ways to manage limited parking on a growing campus but are also tracking, analyzing and managing new and developing transportation options like bike share, electric scooter rental or use, the access shuttle and ride-hailing services to see how they fit into the UO’s evolving campus and community. Reesor and his team decided on the name change after holding numerous focus groups in the fall with a variety of stakeholder groups and individuals, including external partner agencies. Additional outreach is planned for 2019 to get more student input, and Reesor expects to share details in the weeks ahead. Those meetings, and the name change, are the first steps in developing a department strategic plan. Transportation Services will also take the lead in updating the campus master transportation plan. Many changes have taken place in the community, the transportation industry, and the university’s size and footprint, which has a direct effect on parking availability and the habits and ways that people get around since the plan was last modified. While the name change may take getting used to for some longtime UO employees, a similar approach has been used at peer institutions like Washington State University, University of Washington, Oregon State University, University of California, Davis and many others. Transportation Services will implement the new name over time, starting with the website, email signatures and the exterior sign at the office at 1401 Walnut Street. To help save on costs and resources, materials with the previous name will continue to be used. Once those run out, they will be replaced with items using the new name. Information about department services and planning are online, and Reesor said he welcomes questions at dreesor@uoregon.edu or 541-346-5796.